James W "Red" Holloway was born in Helena, Arkansas on May 31, 1927 to a mother who played piano and a father who played violin. At the age of five, he and his mother moved to Chicago, where he graduated from DuSable High School and attended the Conservatory of Music. During grade school, Red played banjo and harmonica in school bands. His first musical instrument, a tenor sax, was given to him by his stepfather when he was twelve years old. 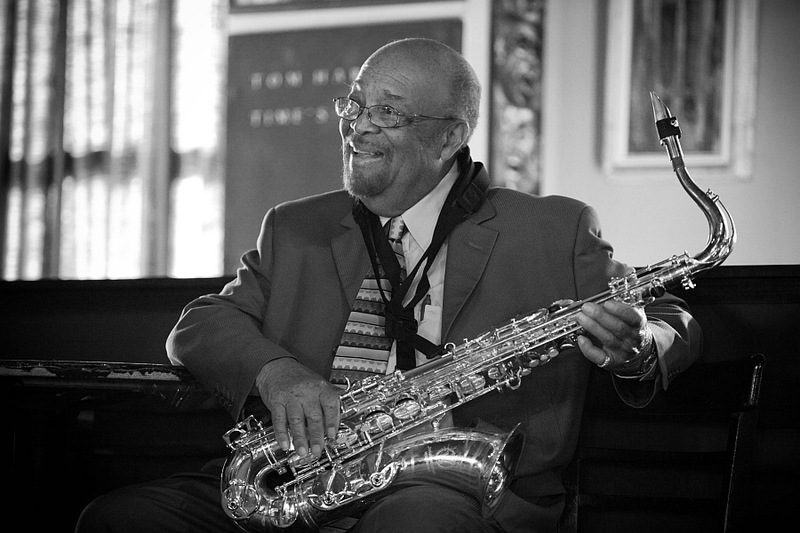 During high school, he was in the DuSable big band, where he sat next to fellow classmate and reedman Johnny Griffin. At sixteen and while still in school, he was hired for his first professional engagement by bassist Gene Wright, who later went on to become a member of the Dave Brubeck Quartet. Red played with Wright's Big Band for three years at the Parkway Ballroom. When Red was nineteen, he joined the Army, where he became bandmaster for the U.S. Fifth Army Band. After completing his military service, Red returned to Chicago and played with Yusef Lateef and Dexter Gordon, among others. In 1948 he was asked by blues vocalist Roosevelt Sykes to join Sykes' U.S. Road Tour. During this time, other bluesmen heard him and subsequently hired him, including Nat "Lotsa Poppa" Towles, Willie Dixon, Junior Parker, Bobby "Blue" Bland, Lloyd Price, John Mayall, and B.B. King. Because of these associations, Red became typecast, perhaps unfairly, as primarily a blues player. During the Fifties, Red continued playing in the Chicago area with such notables as Billie Holiday, Muddy Waters, Chuck Berry, Ben Webster, Jimmy Rushing, Arthur Prysock, Dakota Station, Eddie "Cleanhead" Vinson, Wardell Gray, Sonny Rollins, Red Rodney, Lester Young, Joe Williams, Redd Foxx, Aretha Franklin,a nd many others. During this same period, he also played road tours with Danny Overbee, Sonny Stitt, Memphis Slim, Lefty Bates, and Lionel Hampton. The public finally became aware of Red during the Sixties as a result of his association with organist "Brother" Jack McDuff. Another member of this band was guitarist George Benson. The band was together from 1963 to 1966 and performed road tours in the States as well as concerts in Europe. Red recorded several albums with McDuff on Prestige, including the hit single Rock Candy. In 1967 Red moved to Los Angeles and in 1969 became the coordinator of talent and member of the house band at the famed Parisian Room. This association lasted for the next fifteen years and saw Red hire virtually everyone who was anyone in the world of jazz and blues. Red quit as talent coordinator for the Parisian Room after his request for a cost-of-living raise was denied. The club closed eight months later. During Red's tenure at the Parisian Room, he took occasional breaks for European, South American, and Japanese tours. From 1977 to 1982, he and altoist Sonny Stitt became a duo and cut two records on Catalyst: Forecast; Partners - Sonny and Red. In fact, it was Sonny who encouraged Red to take upthe alto saxophone, believing that anyone who could also play clarinet, flute, piccolo, piano, bass, drums, and violin could probably master yet another instrument. Sonny was right, and Red is equally proficient on both tenor and alto. In The Encyclopedia of Jazz in the Seventies, Leonard Feather wrote that "Holloway is capable of generating great excitement with his big sound and hard-driving, mainstream-modern style." Since Stitt's untimely death in 1982, Red has spent most of his time touring the States and Europe, either as a single or with his own band. He is now in partnership with trumpeter Clark Terry, with whom he has recorded on both Concord and Delox. Red Holloway, a tenor and alto saxophonist who was one of Los Angeles' most highly regarded jazz artists for more than four decades, died Saturday in San Luis Obispo. He was 84. The cause was kidney failure, complicated by several strokes, according to family spokeswoman Linda Knipe. Holloway's career reached from the post-World War II arrival of bebop to 21st century jazz fusion. Whatever genre he played, the powerful muscularity of his sound, combined with his propulsive sense of swing, consistently made him one of the most listenable tenor saxophonists in jazz. His creative focus was enhanced by far-reaching versatility. "Music to me is music," he told Jazz Journal International some years ago. "I really don't care what kind it is. I just try and figure out how I can make that particular type of music swing. That's what is important." Holloway had already affirmed that viewpoint early in his career, when he played with an A-list of artists covering the full gamut of jazz -- from Sonny Rollins and Lester Young to Red Rodney, Lionel Hampton and dozens of others. His capacity to enhance his style with lyrical expressiveness also made him a favorite companion to singers such as Etta James, Joe Williams, Carmen McRae and Jackie Ryan. James W. Holloway was born May 31, 1927, in Helena, Ark. His mother was a pianist and his father played violin. He and his mother moved to Chicago when Holloway was 5, where, at his mother's insistence, he began piano lessons, supplementing them with banjo and harmonica. 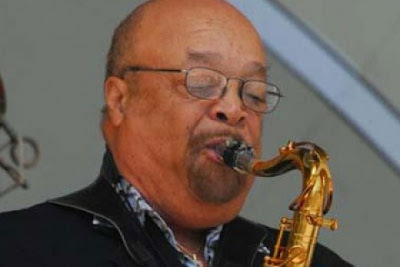 After taking up the tenor saxophone at the age of 12, Holloway played his first job as a professional musician in 1943 with bassist Eugene Wright's Dukes of Swing. At 19, he joined the U.S. Army, eventually serving as headmaster of the U.S. Fifth Army Band. When he was discharged from the service, Holloway returned to Chicago, frequently playing with such artists as Roosevelt Sykes, Willie Dixon and B.B. King. And his intimate understanding of the subtleties of the blues always remained an essential part of his music. In the early '60s, he began to achieve visibility with the wider jazz audience via a 2 1/2-year run with organist Jack McDuff, working alongside newly arrived guitarist George Benson. Holloway moved to Los Angeles in 1967. Two years later he played in the house band at the famed jazz club the Persian Room. He retained the position for 15 years, meeting and often performing with some of the biggest names in the jazz world. From 1977 to 1982, Holloway was teamed with veteran bop alto saxophonist Sonny Stitt, recording a pair of albums together. In addition to more than a dozen albums under his own name, he recorded with McDuff, Clark Terry, Plas Johnson, Horace Silver, George Benson and John Mayall. In the mid-'60s, Holloway moved to the Central California coastal town of Cambria, where he ran unsuccessfully for mayor in 2004. From the early '90s until this year , he played a prominent role in the town's Famous Jazz Artist Series. He received a Lifetime Achievement Award from the Los Angeles Jazz Society in 2004. Holloway, who was divorced, is survived by sons Michael and John; daughters Lianne Holloway, Marsha Aregullin and Denice Holloway-Rivers; six grandchildren; and two great-grandchildren. A third son, James "Binkey" Holloway, died in 1995. The LA Times obituary said that he died in San Luis Obispo. He died at a nursing home in Morro Bay. It also misidentified the Parisian Room music venue in Los Angeles as the Persian Room. Additionally, the obituary said that Holloway ran unsuccessfully for mayor of Cambria, his home since the mid-1980s. The post is an honorary position, not an elected one.